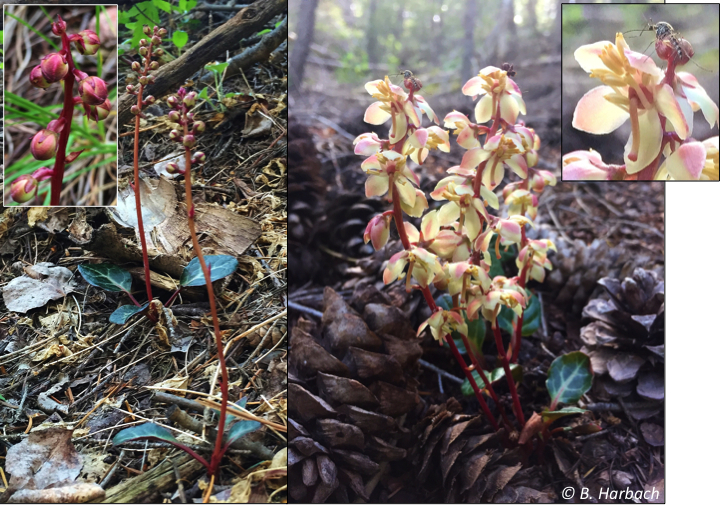 As you can imagine, I was surprised to hear that a species I just described as a Pacific Northwest endemic was observed by a hiker and wildflower enthusiast in Colorado! With my curiosity piqued, excited about the possibility of a southern relictual population, I asked Barb to share some of her pictures with me. What intrigued me most was how long the sepals on the buds in her pictures were! Habitat near the east-central side of Pike National Forest where Pyrola was observed growing. Photo credit: Barb Harbach. Could this represent a massive range extension for Pyrola crypta, a species that, according to my research thus far, is restricted to the Pacific Northwest? With this possibility in mind, I excitedly examined more pictures that Barb had taken on various hikes in her local area, the front range of Colorado. In the images below, she captured plants at different stages of development– this is so helpful because it is easier to see certain characteristics better at different life stages. For example, the long sepals are more visible when flowers are in bud, but when flowers are open (at anthesis), the anthers and style are visible! Plants of Pyrola picta in bud (left), showing atypically long sepals, and in full flower (right), showing a mosquito resting atop the upper-most flower. Photo credits: Barb Harbach. The type specimen of Pyrola picta Smith, the species that occurs in Colorado, was collected by Menzies from the west coast of British Columbia almost 200 years ago. Pyrola picta exhibits a lot of morphological variation overall because it has a very large geographic range– as the environment changes across the range, so do minor aspects of the appearance of P. picta. Can you think of some aspects of the environment that can affect how plants look? What about how much water is available? Changes in altitude? What else? According to my studies, P. picta has much shorter sepals (half the length!) than the plants that Barb showed me pictures of, regardless of whether it lives in southern California, Canada, or Colorado. The long sepals of Barb’s plants resemble those of P. crypta more than P. picta. If I wanted to test the hypothesis that P. crypta has a much larger range than I previously thought, I would need to develop an experiment to test that hypothesis. Can you think of some ways I could do that? What materials could I use? Is the hypothesis I stated (in bold, above) falsifiable? DNA samples of P. picta from throughout its range in California, Oregon, Washington, Idaho, Colorado, and other states. A phylogeny showing the relationships among P. picta, P. dentata, P. aphylla and P. crypta. Measurements of 18 floral features made from specimens of both species. A laboratory I can use to extract DNA from leaves and sequence particular regions (loci) of the genome. If you have some suggestions, leave a comment below! I want to emphasize that the information I get from wildflower enthusiasts, amateur botanists, and others is extremely helpful to me. Not only is it impractical for me to visit every locality myself where Pyrola grows (not to mention that new populations are discovered now and then), but I’m often unable to make multiple visits to distant localities throughout a single season to observe plants at different stages of development. 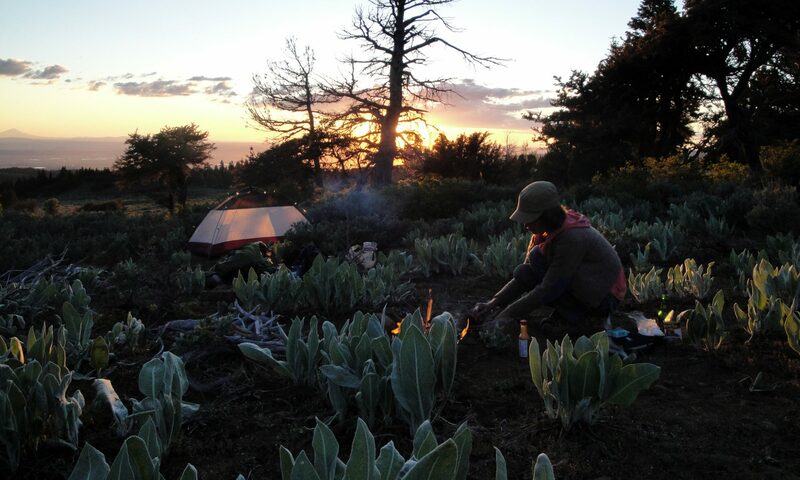 Information from local botanists is essential to helping scientists like myself re-evaluate their scientific work and develop new hypotheses. 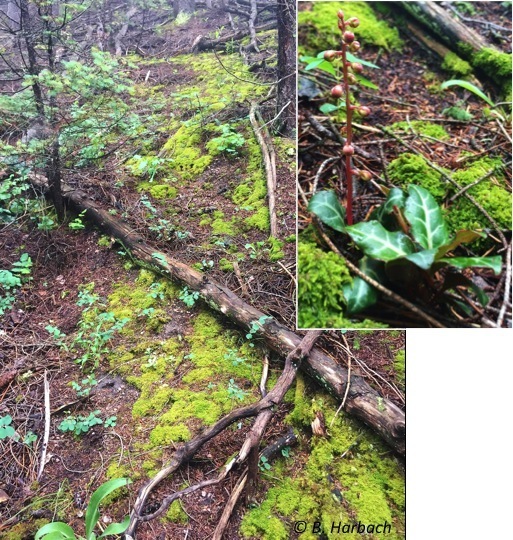 The results of my research are always a work in progress; each time I re-evaluate a hypothesis and add more evidence to my studies, I am closer to a more accurate explanation of how Pyrola species dispersed throughout North America during Pleistocene glacial cycles.